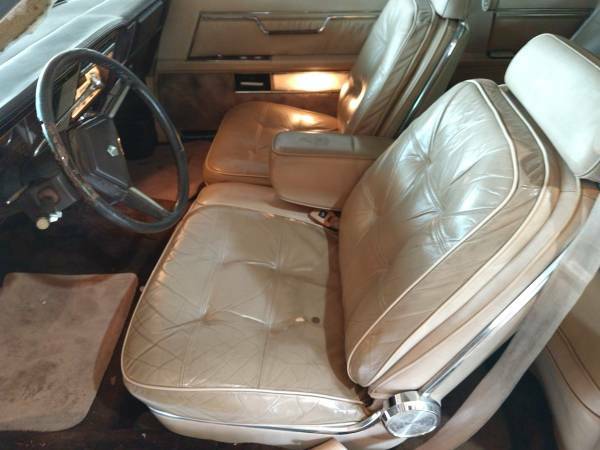 If a J-body Dodge Cordoba with fine Corinthian leather seating was not luxurious enough for you, Lee Iacocca resurrected the top dog Chrysler Imperial flagship for a short run from 1981-83. The Imperial had controversial razor edge slantback styling that was as bizarre then as it is now. Iacocca pal Frank Sinatra lent his name to a special edition though the chairman of the board was supposedly none too happy when his personal car stalled out in public likely due to the finicky fuel injection. 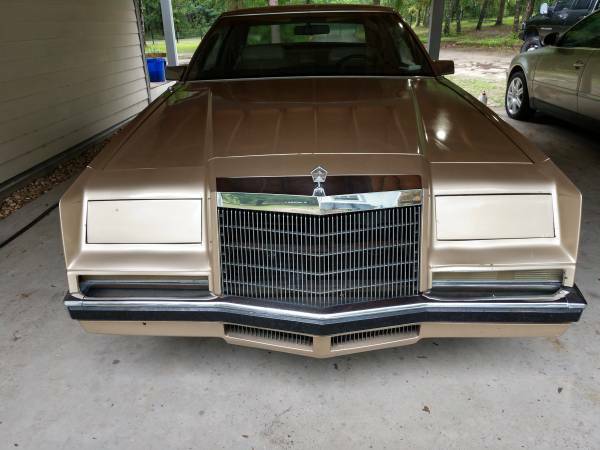 Find this 1983 Chrysler Imperial for sale in Hernando, FL for $5,500 via craigslist. Tip from Fuel Truck. Trade for a 20 to 26-foot center console fishing boat. Want something that is going to the only one at a car show? Want a car that is so rare that people come up to and say what is that? Want something that is going to go up in value if cared for? Want all the toys on your car? For sale or trade 1983 Imperial, (built by Chrysler and badged only as an Imperial) Last rear wheel drive Imperial ever built! Indoor stored for over 12 years! 118k miles, yes its original miles, has a 6 digit digital odometer and there is no asterisk showing. Miles will go up, I drive it to car shows almost weekly if weather cooperates. 1 of 1555 ever built, retail price in 1983 $22,000.00, has an very detailed history, just google 1983 Chrysler Imperial! I am the second owner with original documentation from the first owner including trip log. New welded dual exhaust, sounds great! Complete fuel system rebuild, new sending unit, new fuel pump, new fuel hoses, rebuilt carburetor. Complete brake system rebuild, new master cylinder, new brake hoses, new wheel cylinders, rebuilt calipers. Comes with factory owner's manual, factory service manual, and other flyers. Also has extra parts including a hard to find extra trunk lid. Looks great at 20 feet and turns heads at car shows. $5500 cash or trade for a 20 to 26-foot center console fishing boat. The steering wheel seems to show a lot of wear compared the rest of the car. The 318 V8 only puffed out 140 hp so the addition of a proper dual exhaust should help the engine breathe a bit. The front bumper overhang on the front end of the car is begging for a rhinoplasty, but that is how they came new. Not a pretty car, but definitely unique and unusual. It has a retro-cool factor to it. But I think for the condition, this is all the money. I can't imagine a perfect, low mileage example would be worth more than $15-20K, but that's just my speculation. I haven't exactly been following the '81-'83 Imperial market closely (is there one?). This one is showing obvious rust issues on the trunk and wheel arches. 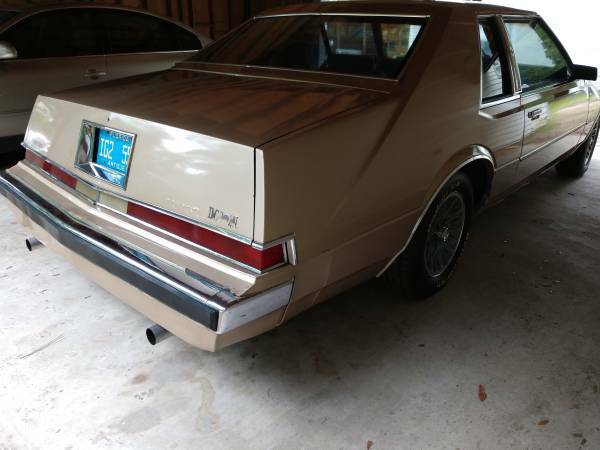 The seller is too optimistic here that the car will appreciate. This car isn't going up in value unless it sees some restoration, which will cost more to perform than a restored version is worth. Just drive it and enjoy it for what it is. I've never understood the 'quilted cushion on top of a cushion' upholstery approach. "Our market research team found that most geriatric evaluation participants referenced the comfort level of their living room sofa when asked how they prefer to sit for extended periods. Our designers and engineers determined the most satisfactory offering would be a variation of the sofa. We present the 'road sofa'!" Think of them as sort of anti bolsters. They give the impression of all that road hugging weight really gripping the corners; you gotta watch out because those massive g forces throw mom right out of her chair. "Trade for a 20 to 26-foot center console fishing boat...."
Heck, just put pontoons and an outboard on this baby. It'll be so rare, every time you go fishing people will come up to you and say "What is that?" This Chrystler has a Banglebutt! That front end shot looks like a Pixar car closing it's eyes and sighing in frustration. Just try to un-see it, you can't.